Cicerone is now listing The Reverend Sandy Brown as one of its authors. According to traditional Catholic cosmology, Purgatory is that grey region between Heaven and Hell where souls continue to be tested before they are sent to their eternal reward or punishment. “Limbo,” it’s sometimes called, and I’ve felt lately it has a lot of similarity to that period of time between when a manuscript is written and when the finished book is published and goes on sale. And that’s precisely where I find myself right now. After completing Way of St. Francis: From Florence to Assisi and Rome back in early January, I sent off the manuscript and immediately heard back from the publisher: they had put the book into their workflow. That meant that a freelance editor had been assigned and I’d be hearing back in a couple of months with edits to the text. While the editing process takes place a few decisions need to be made by the publisher and me. The biggest decision is: in what scale will the maps appear? Our choices are 1:25,000 and 1:50,000. Both have their virtues. A tighter resolution of 1:25000 allows a very detailed view of the route — though it more than doubles the number of map pages. A zoomed out map at 1:50000 takes fewer pages and gives a better overview of the region, but lacks the detail walkers might need. According to the publisher, the book would be 288 pages with maps at 1:25000. Obviously, walkers want a helpful book, but they also don’t want to carry a lot of weight. Jonathan, publisher at Cicerone, promised to send along a couple of map samples using my GPX tracks so we could decide together what scale would be best for the book and whether the 1:25000 option is worth the extra pages. At the point the maps will be produced in draft form and I’ll begin the work of editing them to coordinate with the text. So in the meantime, word has leaked out that the book is in production and I’ve been fielding inquiries from here in the US and also from as far away as Australia. Prospective pilgrims are interested in the route and are anxious to receive the book as soon as possible. They have questions about accommodations, way marks, best routes, and more. I heard from the Via di Francesco folk at the Umbria Tourism office in Italy that they’re also anxious for the book because they’re answering many inquiries from English speakers who want more information about walking to Rome. That means that before and after my long days of campaigning for city council I’m in conversation with many of these people, providing what resources I can prior to publication of the book. Some people’s plans are quite interesting. For instance, Bill Bennett from Australia is planning a culinary-focused April/May walk from Santuario della Verna to Assisi that looks fun and delicious. I’ve shared an unedited manuscript with him, along with my GPX tracks, so he can proof the text. A woman contacted me who’d like to walk from Florence to Rome, hoping to find solitude and peace after the death of her son. Another contacted me for a September walk, and we’re hoping the book will be finished on time so she can simply take it along. 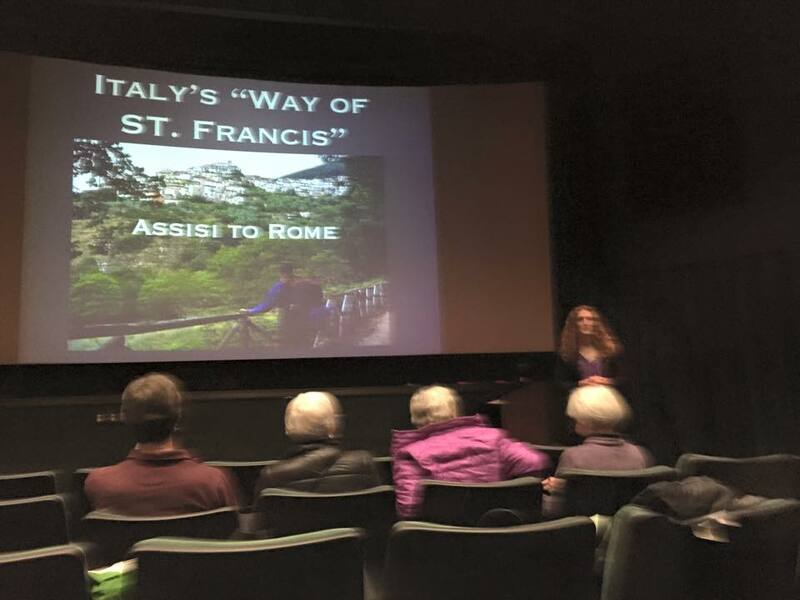 Most surprising to me was meeting a local woman, Sheri Goodwin, who is giving talks about her walk from Assisi to Rome last year. Through her business, Transformational Journeys, Sheri trains women to walk on long treks. I was delighted to receive word that she was speaking on the Via di Francesco at a Rick Steves Europe event in Edmonds last month. Theresa and I attended and loved Sheri’s informative program and slides, which featured many locations dear to us from last year’s walk. We’ve agreed to team up for future talks at Rick Steves and other locations around the area once the book is published. There’s that phrase again, “once the book is published.” I hate to wish for time to pass quickly, but I’d love to move from the frustrating “not yet” into the joyful “already.” I’m starting to dream and scheme about heading to Italy after the election with a couple of boxes of books for a couple of weeks. It’d fun to see familiar sites and beloved friends again and introduce this book as a resource for others to use and enjoy in trekking on the Way of St. Francis. But this purgatory requires patience. Let’s see, September 1 is exactly six months away. That’s about 180 days more of waiting and counting to go. This entry was posted in Via San Francesco 2014 by SandyBrown. Bookmark the permalink. Thanks for the update; lots of others are waiting and counting with you! With regard to maps, does Cicerone ever publish a separate map book in conjunction with a guide? I.e., perhaps 1:50,000 maps in the guide book with a companion map book available at 1:25,000? I know Brierley offers companion map books to his guide books of the Camino de Santiago; can’t remember if the map book maps are different scale though. Will there be an electronic version of your book? If so, weight would not be a problem for those who get that format. I suppose in a perfect world, perhaps the electronic would be 1:25,000 and the paper 1:50,000. Any way, good luck with all your endeavors. Thank you for the good works. Hope the book comes out before we leave but it doesn’t look like it. That’s great, Megan. The book seems to be available at FishPond, in NZ and also with free worldwide delivery at Book Depository. Please feel free to contact me anytime with any questions. Meantime, buon cammino!